Police have widened an investigation into allegations of corruption against Israeli PM Ehud Olmert to also look at whether he may have committed fraud. A joint statement by police and the justice ministry said he was suspected of seeking "duplicate funding for his trips abroad from public bodies". Earlier, Mr Olmert was questioned for a third time over allegations stemming from before he became prime minister. 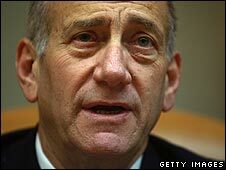 There have been calls for Mr Olmert, who denies any wrongdoing, to resign. His governing Kadima party is due to hold a leadership election in mid-September. Earlier, Mr Olmert was interviewed by police for a third time as part of an inquiry attempting to establish whether he dispensed favours in exchange for funds he allegedly received illegally from a US financier, Morris Talansky. Mr Talansky has testified he gave hundreds of thousands of dollars in envelopes full of cash to Israel's prime minister but said he did not seek or receive any favours in return. Mr Talansky has said some of the money was used for expensive personal items, and funds intended as loans were never repaid. Mr Olmert has said the funds were used legally for election campaigns. A statement issued by the police and justice ministry after Mr Olmert was interviewed said he had also been "asked to give his account about suspicions of serious fraud and other offences". "According to the suspicions, during his tenure as Jerusalem mayor and trade and industry minister, Olmert would seek duplicate funding for his trips abroad from public bodies, including from the state, with each of them requested to fund the same trip," it added. Police suspect that the "considerable sums" that remained after the travel expenses were paid for were transferred by Mr Olmert to a special account his travel agency administered for him. "These monies were used to finance private trips abroad by Olmert and his family," the police statement said. Mr Olmert was mayor of Jerusalem for 10 years until 2003. He then served as minister of trade and industry for two years before succeeding Ariel Sharon as prime minister. He has not responded to the latest allegations, but has previously denied all wrongdoing and said he will resign if he is indicted.